This piano Prelude is an attempt to imitate vocal fluctuations and vibrato found in ca tru using the equal tuning of the piano that has only semitones as the smallest intervals. This is contradictory as the singer is able to flexibly use microtones, which are smaller the semitones on the piano. But will using flashes of cluster to create a blur effect work? The piece carries familiar Ca tru figures from the melody in the voice, the lute patterns and drums as the base material or inspiration for musical ideas. Miroir, memoires by Ton That Tiet was written in 2011 and is dedicated to Jeff Von der Schmidt, Jan Karlin and Southwest Chamber Music. The composer presented it to us in Paris as a surprise present thanking us for our work for new music in Vietnam. In three short movements, the quartet is quietly meditative, patient, sometimes active, but always returns to a sense of centered tranquility. Tiet writes that to understand his music one must study Buddhism, Taoism and Hinduism, a spiritual journey infused by Asian thought and Western instruments. After the inaugural 2012 LA International New Music Festival in Los Angeles, composer-in-residence Vu Nhat Tan turned to Jeff and me, remarking that “Once is not enough!” He was wrapping up six weeks in Los Angeles, courtesy of the Asian Cultural Council in New York City, and we had spent much time dreaming of next steps for contemporary music in his hometown of Hanoi, Vietnam. Southwest Chamber Music’s historic Ascending Dragon Music Festival in 2010, the largest cultural exchange between Vietnam and the U.S., had left us with many questions about the U.S. Department of State’s goal of identifying a new generation of cultural leaders. Had we accomplished this goal? What would be the followup to the project and would it have lasting results? Had we influenced the cultural life of another country, one with which we are tied together with a challenging history? We have observed over the past twelve years, with eight trips to Vietnam, that the country is definitely on the move. Tan is part of a generation who studied outside of Vietnam but decided to return to his country rather than make his career abroad. His participation in Ascending Dragon encouraged him to think in new directions, especially after music critic Mark Swed wrote in the LA Times that Tan was ready to take his place on the international stage. A rapid-prototyping session about Tan’s ideas at the Drucker Institute at Claremont University during Tan’s residency identified three goals: Hanoi needed its first New Music Ensemble; the Hanoi composers and new ensemble should find ways to interact with other new music communities in southeast and east Asia; and we needed to encourage continuing interaction with the American Embassy’s cultural division as well as other countries’ cultural representatives in Hanoi. We returned to Hanoi for the first time after Ascending Dragon in 2013. Our friends couldn’t have been more welcoming, and Tan was ready for us to help him with his new ideas. With our past experiences working in Vietnam, Jeff knew that we could only be effective if we had an official position. In the U.S., we would have been placed on a Board of Directors or an Advisory Board, but these structures do not exist in the same way in Vietnam. We suggested to Tan that we needed a title and proposed that we both be appointed as the first American artistic advisors to a new group, the Hanoi New Music Ensemble. We could share our experiences as founding directors of 30-year old Southwest Chamber Music to help establish Vietnam’s first contemporary music group. 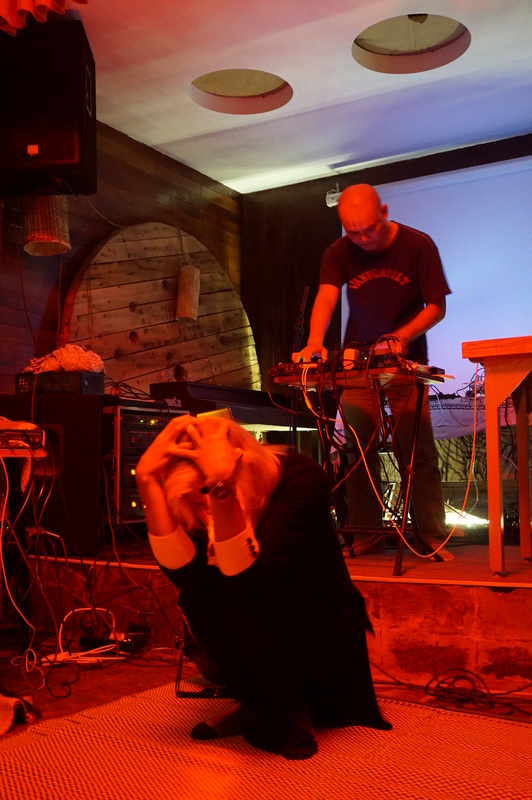 In the past, contemporary music in Vietnam reflected the Russian model of mostly encouraging composers of pop music, commercials, film, military functions and television. 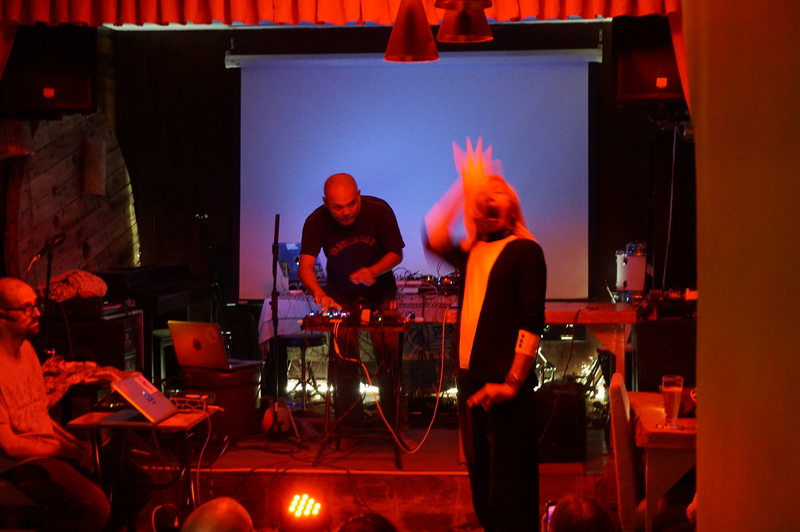 Experimental music was not part of the cultural environment. An older generation of serious Vietnamese composers had emigrated abroad because of the French and American wars. The two grandfathers, Nguyen Thien Dao and Ton That Tiet, moved to Paris in the 1950s and became French citizens. They both have had great international successes with major conductors and international commissions for new works. Tiet is a friend of Tan’s father and was very influential when he met Tan as a young composer. We were thrilled when Dao appeared in Hanoi for Ascending Dragon to hear a performance of his work for double bass performed by Southwest bassist Tom Peters. The situation in Vietnam for 20th century Western instrumental technique reflected the history of the country. During three wars with France, the U.S. and China, musicians could rarely have the luxury of looking outside of their own boundaries. We affectionately say that the instrumentalists unfortunately skipped the 20th century, with few if any performances of works by Stravinsky, Schoenberg, Messiaen, Bartok, Takemitsu, Cage, Carter and even Debussy and Ravel. Shostakovich was the token new music composer occasionally played. There are also many traditional musicians performing extraordinary Vietnamese music whose music was denigrated by colonialist powers as unimportant and unworthy of an audience; this traditional music is beginning to find an audience as the Vietnamese embrace their own historic creative culture. The situation Tan and other Vietnamese contemporary composers found was that they had the skills to compose for instruments, but there were not experienced musicians to play their music. There also were not any conductors or teachers versed in 20th century techniques. As Rector Dr. Thanh said to me on our first meeting in 2005 when we enquired as to the purpose of Southwest coming to Vietnam, “if our students do not know all of 20th century music, they will not be able to take their place on the world stage.” Many of the composers whose works we presented on our 2006 and 2010 Ascending Dragon tours had never been heard in Vietnam. Jeff with Tan and composer Tran Kim Ngoc who also returned home after study in Germany and the U.S.
How should Tan set up a new music ensemble in Hanoi? As former Southwest board president Mary Schander observed, a developing country suffers from not having examples of successful organizations. When we began Southwest Chamber Music, we could look to numerous other groups such as Kronos Quartet, Chamber Music Society of Lincoln Center, Santa Fe Chamber Music Festival and the London Sinfonietta as examples of success. There is a national chamber music service organization, Chamber Music America, that provides workshops, conferences, grants and networking. There are non-profits that provide lawyers for incorporation, marketing advice, and development seminars. None of this was available in Vietnam, only two American artistic advisors with a lot of expertise! It took two and a half years for our appointments to become reality. Navigating the government and the Vietnam National Academy of Music (VNAM) took time as this was the first appointment of Americans as cultural advisors. In August 2015 we received our official stamp from the Ministry of Culture, and we were asked to travel to Hanoi in September for three concerts in October – welcome to our new positions! Tan had chosen three beautiful venues for the inaugural concerts of the Hanoi New Music Ensemble – the Old Quarter Cultural Center, Manzi Art Space and the new auditorium at VNAM. The ensemble would present the first music performance at the Old Quarter space, a small arts center in the historic center of the city. Geir Johnson from Norway had spearheaded the addition on the top floor of an intimate concert space with beautiful acoustics. Upon arrival in Hanoi, we met with our colleagues at the American embassy with whom we had worked closely over the past decade. We invited U.S. Ambassador Ted Osius to attend the inaugural concert and asked if the Embassy could sponsor a small reception on site following the concert. We were pleasantly surprised when we were informed that the Ambassador not only wished to attend and address the audience (in Vietnamese!) but also wanted to host a special reception at his residence for the ensemble, composers and specially invited guests, in honor of our appointments as American artistic advisors. We were thrilled, to put it mildly! All three concerts were successful, with capacity crowds at the Old Quarter Cultural Center and Manzi Art Space. The concert at VNAM outdrew the local orchestra. The paying audience was overwhelmingly young and Vietnamese, enthusiastically listening to their own contemporary creativity. The reception at the Ambassador’s residence introduced the new ensemble’s members to business leaders, diplomats and other important guests. Two other concerts in the spring kept the ensemble moving forward with solo and small ensemble works without conductor. There was great enthusiasm and plans were made to invite us back the following fall. We were off to a good start and the challenge was how to keep it growing and moving forward. Jeff and I had plenty of good ideas, but we knew the group had to proceed one step at a time. Tan and the ensemble needed to absorb their success and decide how they should proceed. Obviously there was an audience eager for what they had to offer their community. Jeff and I returned home elated. The initial steps had been positive and encouraging. 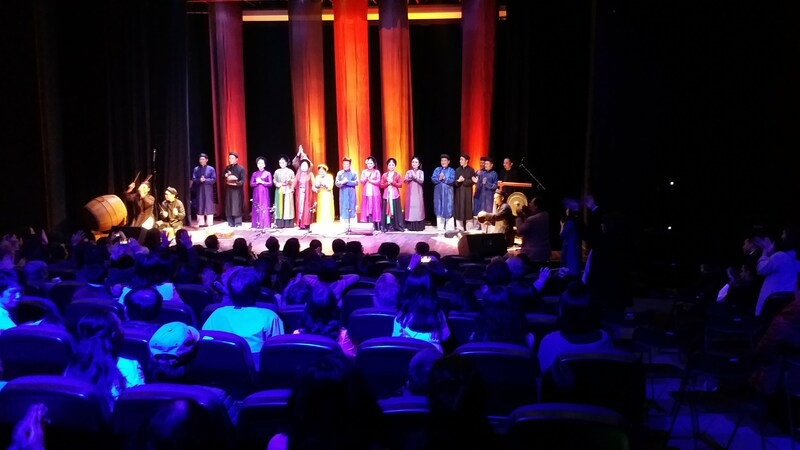 We were determined to help the Hanoi New Music Ensemble inspire their audiences with new Vietnamese creativity. 56 Nguyen Thai Hoc str, Ba Dinh dist. 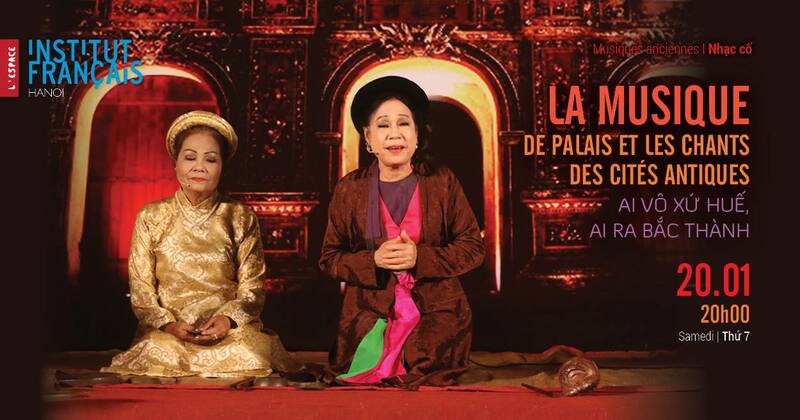 His lyrics seems appropriate for an adaptation by the rich Vietnamese musical tradition of poetic performances. 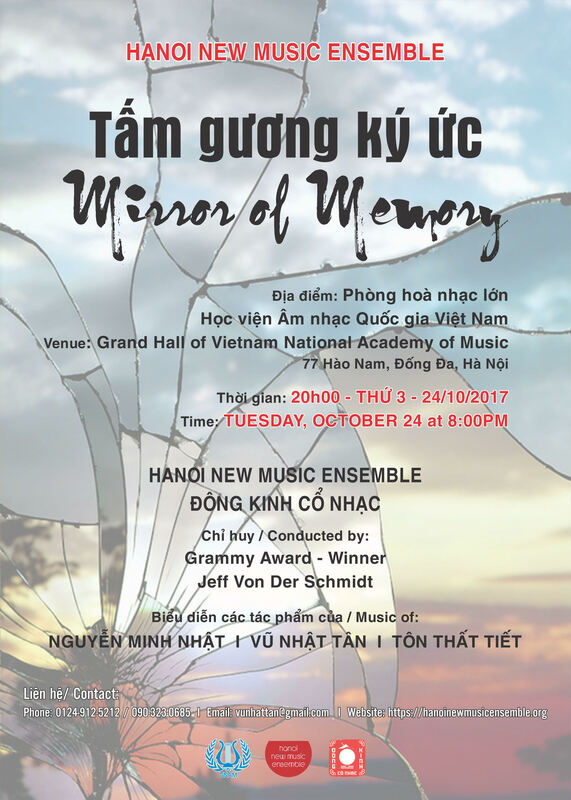 The music ensemble “DONG KINH CO NHAC” has prepared a program devoted to Heinrich Heine, entitled “Lyric and Tradition”. 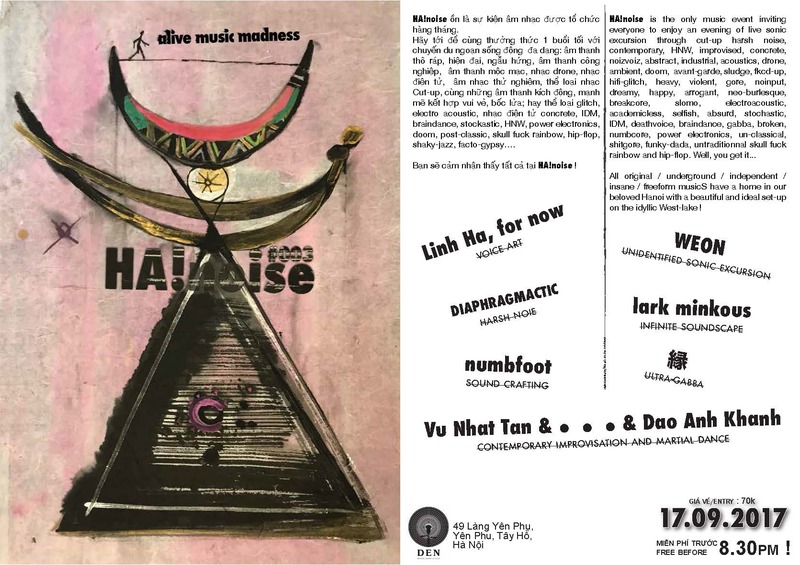 They will put Heine’s poems onto stage through a variety of Vietnamese theatrical such as “Tương tư khúc” of Huế singing, “Du Xuân” of Chèo, “Cờn Nam” and “Vãn” “of Chầu Văn. ‘Intransmission’ is a series of experimental multidisciplinary live art shows exploring individual perception and collective experience. Its first edition will take place in Hanoi. 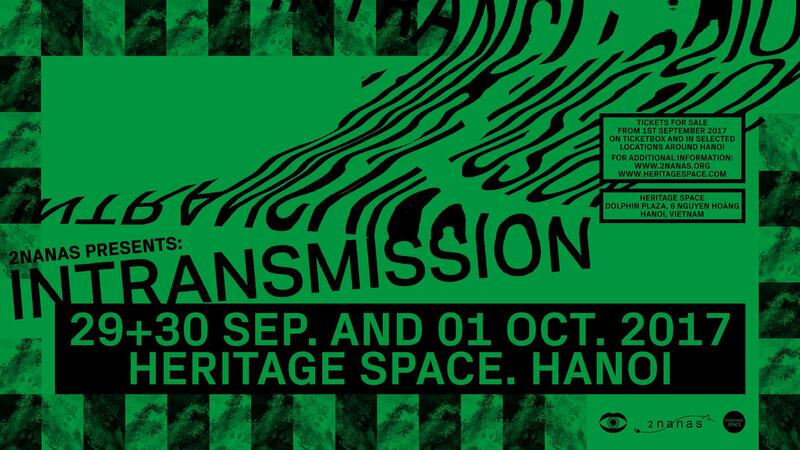 ‘Intransmission’ Hanoi aims to provide an immersive experience, and we thus hope to keep as many details secret as possible to maximise the surprise effect for all of you! This is why we can’t give you a complete rundown of what we’ve planned for inside. What we can tell you however, is that there will be two separate rooms. While each room will contain its own site-specific art installation and distinct music act, they will both be connected: audio and visuals from Room 1 will be live-streamed to Room 2, undergoing distortions in the process. Participating artists and collaborators: Think Playgrounds (installation, Space 1), Daniel Day Long & Julien Noyer (visuals, Space 2), Rec Room (sound design for both spaces), Hai Duy (percussion, Space 1), Linh Ha (vocals, Space 1), Nguyen Thu Thuy (dan ty ba, Space 1), Vu Nhat Tan (music, Space 2), Alistair Hobson (music, Space 2), Numbfoot (music, Space 1 & 2) and Quan (music, Space 2). ‘Intransmission’ explores the concept of perception, and what we call ‘derivative experience’ (i.e. indirect experience through an external narrative). 1. How individual perception conditions communication channels. Do we see reality for what it really is? How do our memories and past experiences influence our perception of the world around us? To what extent is our understanding of reality conditioned by mass media, and what are the consequences of this global scale phenomenon? 2. What is lost in channels of communication. We are interested in exploring what happens when we communicate our realities with others, and specifically what elements of our realities get distorted or lost in the process. The series thus explores the ‘lack of transmission’ (i.e. distortions and omissions which occur in communication), in an attempt to address the relationship between first-hand, and derivative experience. 2nanas is an emerging multidisciplinary production agency. Its areas of competence include artistic conceptualisation and direction, and providing production assistance, in the fields of visual arts, contemporary music and social/community projects. Its two founders, Anita Wilczega and Dalia Somi, work in collaboration with artists, creators, musicians and organisations, creating expert teams for original projects. 2nanas organises its own creative events, while also helping artists bring their projects to life. 2nanas first solo art exhibition, ‘intransmission’, is planned to open in September 2017 in Hanoi, Vietnam.